History: I’ve been Coasteering professionally for around 10 years. I’ve noticed a split in terms of those guides that wear some type of approach trainers and those that wear wet suit boots (split toe and rounded toe). I’ve always been in the wet suit boot camp primarily because I came from a Lifeguarding background. My first ever Coasteering session I wore wet suit boots and I’ve stuck with them ever since. When it comes to buying something different I’ve always erred on the side of caution and I’ve been rock climbing since I was 15 and rock climbers like things that can be used for more than one task.. Wet suit boots double up for surfing as well as Coasteering. See where I’m coming from? Rational: I’d been struggling with a foot injury for some time and my wet suit boots were on the way out so thought it was about time I considered an alternative to the wet suit boots. At the moment I’ve not come across anything designed specifically for coasteering. 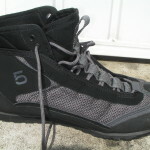 Product Options: Five Ten Canyoneers, Five Ten Water Tennie, Teva Cherry Bomb 2, Approach Trainers (various choices). My decision: I opted for the Water Tennie based on look, feel (in the shop), cost and ultimately because they kind of felt like they would be the best option based on the various choices available. Try before you buy wasn’t an option. The Canyoners looked and felt to cumbersome for me. I felt they would slow me down more in the event of a tow / swim rescue or some defensive swimming. That said I didn’t feel that the Water Tennie would be much better for swimming. I’m not the biggest of blokes and the Canyoneers looked too clumpy on me. Approach shoes never really had a look in as I’d tried Salomon X Country trainers whilst kayaking and always found them to be unreliable on the side of the river during throw line work or rescues. They have no ankle support and the tread never gave me any confidence and I’d fallen over a couple of times when on wet rocks. The Water Tennie has a similar profile (slim fitting which I like) to trainers so part of my choice was based on the fact that they will double up for kayaking in winter if I don’t get on with them for Coasteering. I did not think I’d get my feet in a kayak if id been wearing Canyoneers. And the water tennies have some ankle support which appeals to the river side of my brain. Multi use is always a good option for me. They also happened to be the cheapest of the various options. So…. how are they ? Feel: They feel comfortable and I’m opting for bare feet rather than wearing anything other than the boot as I want to keep the overall feel to a similar feel to what I’m used to with the wet suit boots. If I wear wet suit socks I think I will lose a little bit of connectivity to the rocks. Quick lace system: Not sure that the quick lace system is much better than traditional “non quick lace system” but I have no real complaints about the laces. They are kind of stretchy which allows them to be cranked up really tight which I thought was very useful. I hate lose fitting equipment. As with all trainers after I set off on the session I had to stop and then re-tighten after a couple of minutes. By then I’d got a quick idea of how tight I wanted them before I got going for real. Sizing: I tried them on bare foot and that’s how I intend to wear them. As a result I dropped down one size as my feet shrink a wee bit in cold water. I normally wear size 8 but have gone down to 7 which make me look like a pixie but the Water Tennie fit pretty well. No hot spots or blisters to report. Apparently these are good for adventure racing. Can’t comment on that but I do not think I’d be able to run any distance wearing these without having sore feet. Rubber toe cap: This gave me some confidence especially as my foot injury is toe related. I felt nimble and confident on rocks guiding and assisting my clients. Heel cap: I can’t say that I really noticed the benefits of the heel cap but it is early days and they might be really useful going forward but as yet I have no real comments with this aspect of the boot. Neoprene upper. 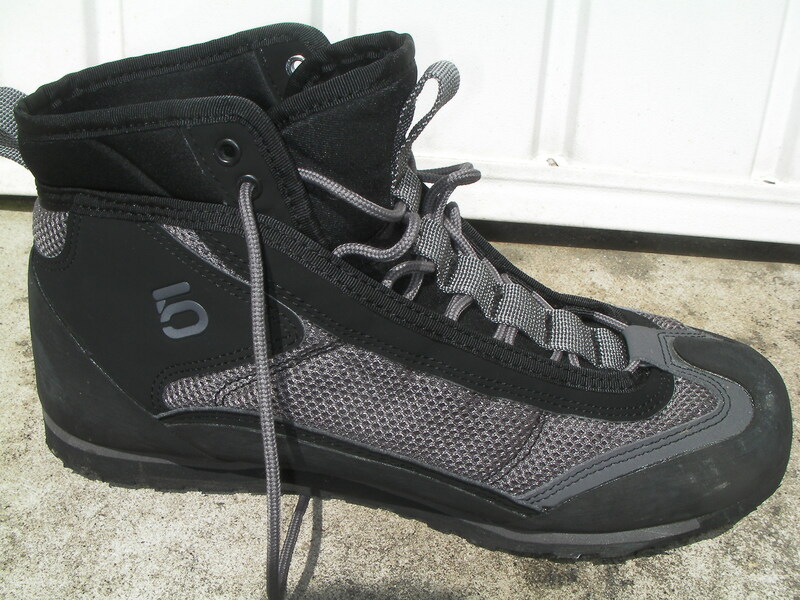 : The upper part of the boot has a neoprene upper which added to the overall comfort for me and gave the boot a similar look to what I was used to with wet suit boots. The flexibility of the upper was an added dimension that I’d not been expecting and this meant I was less aware of them on my feet. Aqua stealth sole: I love the names that companies give their products but ultimately the sole was a real winner for me. Very sticky on wet rock (without seaweed) and I would have to say that this is the biggest positive for me regarding the Water Tennie. I felt really confident on wet rock much more so than I have ever felt in wet suit boots and in a session with lots of scrambling the Water Tennie was pretty awesome. Weight: Very light and not overly heavy compare to my traditional wet suit boots (part of the appeal). Noticeably a different weight to wet suit boots but not prohibitive. Drainage: I had no problems during the session with water filled boots and neither did I notice the boots draining or filling up for that matter. Durability: They look and feel like they will last a good season but I will update the blog as time goes on if there are any changes. Overall: The feel is good and they are very comfortable for walking. When l jumped in for the first time I noticed a different sensation (connectivity to the sea) from what you feel with wet suit boots, mainly because Water Tennie have a sole and I felt like I could jump from a great height with no problems. Less feel in the water but that is not a big part of guiding for me. Swimming: Overall this was my biggest concern and I did not think afterwards that I’d compromised my ability in the sea to an extent that I should rethink my footwear. Swimming was different but not so bad. In fact when you wear a Buoancy Aid you tend not to kick with your legs when you swim as much as without a buoyancy aid. If I had to do a rescue tow (which I’m not intending to do for fun) I would imagine I’d rather be wearing wetsuit boots for that particular moment. So I’ll have to update this blog if that happens. I intend to do some practice towing wearing the Water Tennie before the season gets underway proper. On the rocks: The Water Tennie came into their own and performed excellently on wet rocks. In fact I have never felt so confident during the session as I did and I was mainly on scrambly type terrain for most of the session. Rocks were part covered and the sea was fairly turbulent at times. Any negatives: Cost compared to wet suit boots. Look – kind of “funny” worn with a wet suit compared to wet suit boots. But I’m over that and actually think I look like a ninja! Drying them out is slower and I’m wondering what sort of life span they will have during the season? Too early to say. All in all I’m really happy with them and if they continue to perform it will be hard to go back to wet suit boots. If I had to score them out of 10 (10 is best) I would probably go to 8•5 / 10. Improvements are hard to quantify just at the moment but as the season goes on I will try and be more precise with any recommendations.. Why not 9 or 10? Well it’s just too soon to be that complementary. Nothing is perfect is it? ?